In Soviet times the night train Express was a backup of the famous Red Arrow, and the only difference between the 'twins' was the departure time (Express departed 4 minutes earlier). In 2007 the train was fully renovated and got its original decoration. 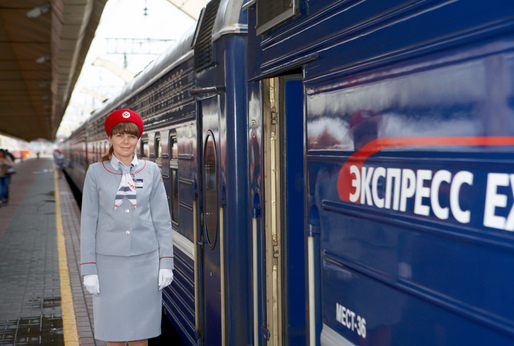 Since 2013 Express departs at 23:30 and arrives at 08:30 year-round 6 days a week (except Saturday), in 9 hours connecting Moscow and Saint Petersburg without stops on the way. A large compartment with a private bathroom. The cabin is sold entirely. Seats: Transforming sofa 120 cm wide, upper berth 90 cm wide (folding). Berths arrangement / number: vertical / 2. Included service: meal, hygienic kit, bath robe, slippers, superior linen. Amenities: folding table, chair, TV, DVD, WC, shower, individual a/c, safe. Carriage: 6 large compartments. A single superior compartment. Capacity: 1 person. Facilities: 1 berth, a folding table. Included service: meal, hygienic kit, superior linen. 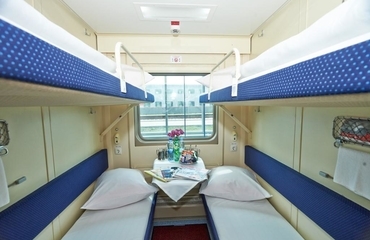 Carriage: superior; 8-10 compartments, a/c, bio toilets. The train consists of 18 carriages: 2 luxury cars, 6 first class cars, 8 second class cars, a restaurant car and a staff car. The luxury compartments are equipped with private bathrooms with shower and individual air-conditioning. 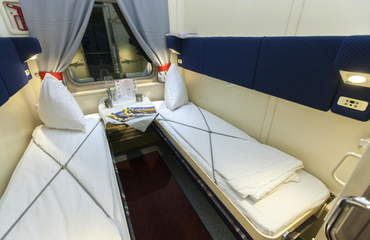 The arrangement of berths in the first class compartments is vertical, which is not typical for most Russian trains and gives some advantages: the first one is that the beds are wider (83 cm), and the second advantage is that lying on the upper or lower berth you do not have to look at your neighbor all the time during your trip.